It has been called the great pothole plague. An estimated nine million vehicles sustained pothole damage in 2013, leading to around £1.2bn worth of repair bills. With an estimated £10.5bn maintenance backlog on roads across England and Wales, there’s no quick fix. Record the location, road name or number, your direction of travel, the position of the pothole relative to the kerbside or centre line, its size and depth and – if possible – obtain contact details from any witnesses. Make sure it is safe to take photographs and add any familiar object (such as a CD case or drinks bottle) to help illustrate the scale of the hole. Regardless of whether or not you intend to make a claim for damage, you should report the pothole to the authority responsible for the road. Main trunk roads are maintained by the Highways Agency while county, city or borough councils are responsible for the upkeep of other roads. Telling them about the pothole means they can address the problem. Obtain the most competitive quote for any required fix and then carry out the repair to the damaged part of your vehicle. Keep all quotes, invoices and receipts. You will need to provide copies of these when submitting your claim to the relevant highway authority. If the damage is more serious than a bent alloy wheel and damaged tyre, contact your insurance company. Most authorities have pre-prepared application forms that they will send you. Submit your claim in writing to the highway authority, providing a clear and concise account of what happened, where and when, and the costs of repairing any damage. 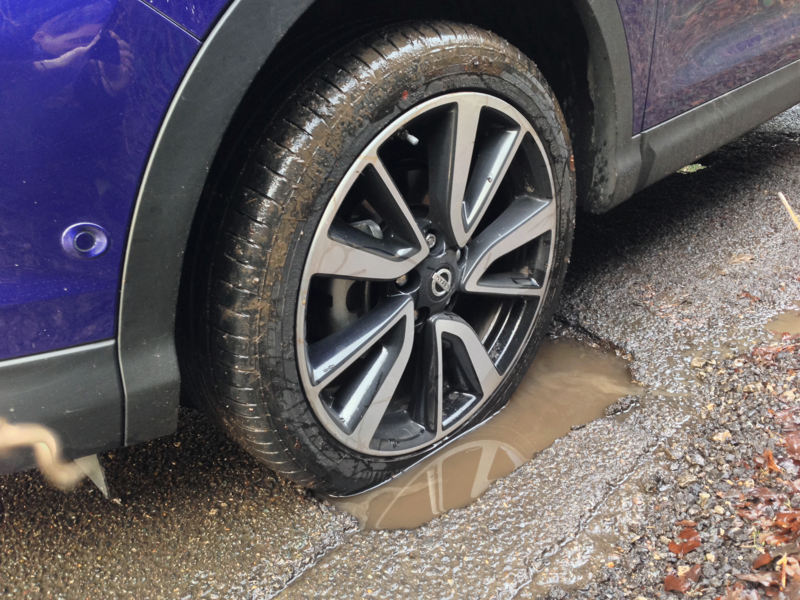 Your claim stands more chance of being successful if the authority was already aware of the pothole but had not fixed it – see section 58 of the Highways Act 1980 – or if the council has not followed road maintenance guidelines. If the council rejects your claim, don’t blow a head gasket. Stay calm and consider submitting a Freedom of Information Act request to the council to discover how frequently the road in question is inspected and maintained. It could be that it hasn’t satisfied the national recommended standards for highway maintenance. The law would not expect the defendant to put you in a better position that you were in before the accident: for example replacing heavily worn tyres with new ones. So consider negotiating with the authority to meet them halfway on the cost of the tyres. It may prefer this to the cost of a court case. If you feel the relevant authority has failed to adhere to national guidelines, and believe you have a case, then consider making a small claims case.